In 1616, the Rolfes traveled to London. Pocahontas was presented to English society as an example of the "civilized savage" in hopes of stimulating investment in the Jamestown settlement. She became something of a celebrity, was elegantly fêted, and attended a masque at Whitehall Palace. In 1617, the Rolfes set sail for Virginia, but Pocahontas died at Gravesend of unknown causes. She was buried in St George's Church, Gravesend in England, but the exact location of her grave is unknown, as the church has been rebuilt. Pocahontas' birth year is unknown, but some historians estimate it to have been around 1596. In A True Relation of Virginia (1608), Smith described the Pocahontas he met in the spring of 1608 as being "a child of ten years old". In a letter written in 1616, he again described her as she was in 1608, but this time as "a child of twelve or thirteen years of age". Pocahontas was the daughter of Powhatan, paramount chief of Tsenacommacah, an alliance of about thirty Algonquian-speaking groups and petty chiefdoms in Tidewater, Virginia. Her mother's name and origins are unknown but she was probably of lowly status. The colonist Henry Spelman, who had lived among the Powhatan as an interpreter, noted that when one of the paramount chief's many wives gave birth to a child, the mother was returned to her place of origin, to be supported there by the paramount chief until she found another husband. In the traditional histories of the Powhatan, Pocahontas' mother died in childbirth. 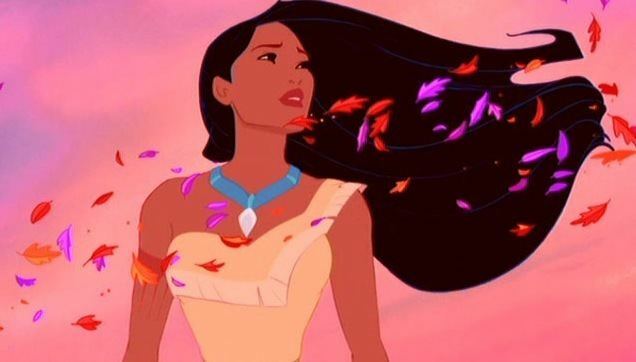 Pocahontas' childhood was probably little different from that of most girls who lived in Tsenacommacah. She learned how to perform what was considered to be women's work, which included foraging for food and firewood, farming, and searching for the plant materials used in building thatched houses. As she grew older, she helped other members of Powhatan's household with preparations for large feasts. Serving feasts, such as the one presented to John Smith after his capture, was a regular obligation of the Mamanatowick, or paramount chief. 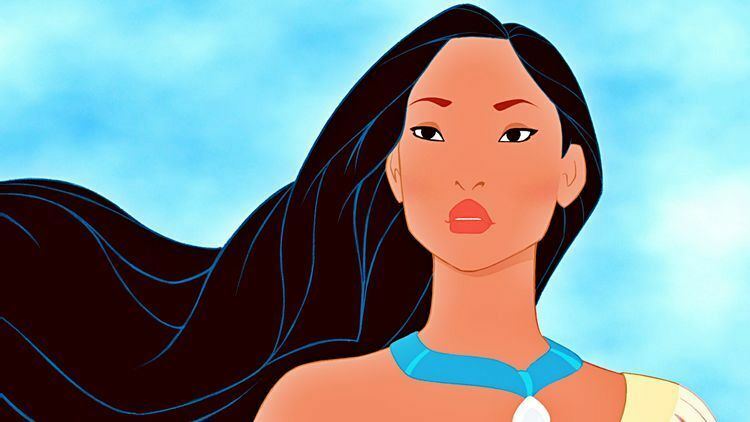 The name Pocahontas was a childhood nickname that probably referred to her frolicsome nature; according to the colonist William Strachey, it meant "little wanton"; some interpret the meaning as "playful one". 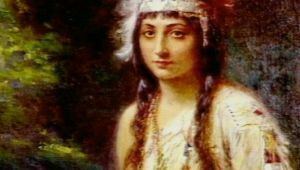 The 18th-century historian William Stith claimed that "her real name, it seems, was originally Matoax, which the Indians carefully concealed from the English and changed it to Pocahontas, out of a superstitious fear, lest they, by the knowledge of her true name, should be enabled to do her some hurt." 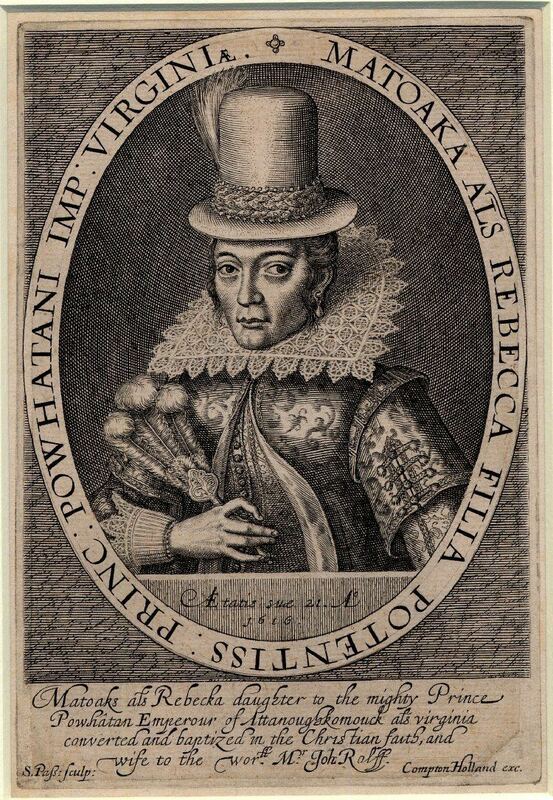 According to the anthropologist Helen C. Rountree, Pocahontas "revealed [her secret name] to the English only after she had taken another religious—baptismal—name, Rebecca". 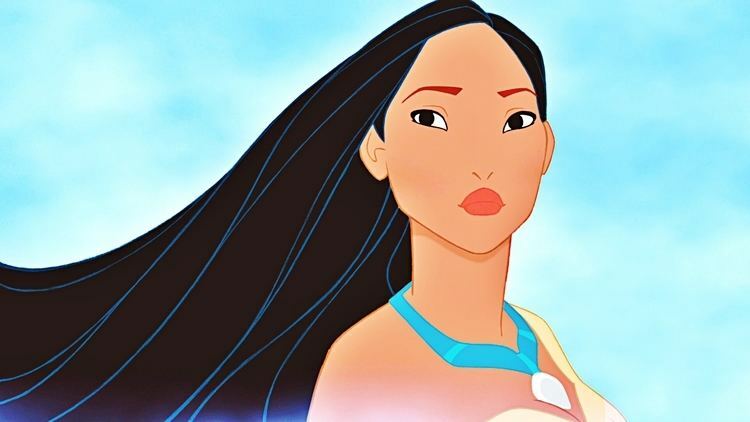 Pocahontas' Christian name, Rebecca, may have been a symbolic gesture to Rebecca of the Book of Genesis who, as the mother of Jacob and Esau, was the mother of two "nations", or distinct peoples. Pocahontas, as a Powhatan marrying an Englishman, may have been seen by herself and by her contemporaries as being also, potentially, a matriarchal figure of two distinct peoples. Pocahontas is most famously linked to the English colonist Captain John Smith, who arrived in Virginia with a hundred other settlers in April 1607, at the behest of the London Company. After building a fort on a marshy peninsula poking out into the James River, the Englishmen had numerous encounters over the next several months with the Natives of Tsenacommacah, some of them friendly, some hostile. Then, in December 1607, while exploring on the Chickahominy River, Smith was captured by a hunting party led by Powhatan's younger brother (or close relative) Opechancanough and brought to Powhatan's capital at Werowocomoco. In his 1608 account, Smith describes a great feast followed by a long talk with Powhatan. He does not mention Pocahontas in relation to his capture, and claims that they first met some months later. Huber understands the meeting of Smith and Powhatan as the latter's attempt to bring Smith, and so the English, into his chiefdom: Powhatan offered Smith rule of the town of Capahosic, which was close to Powhatan's capital at Werowocomoco. The paramount chief thus hoped to keep Smith and his men "nearby and better under control". 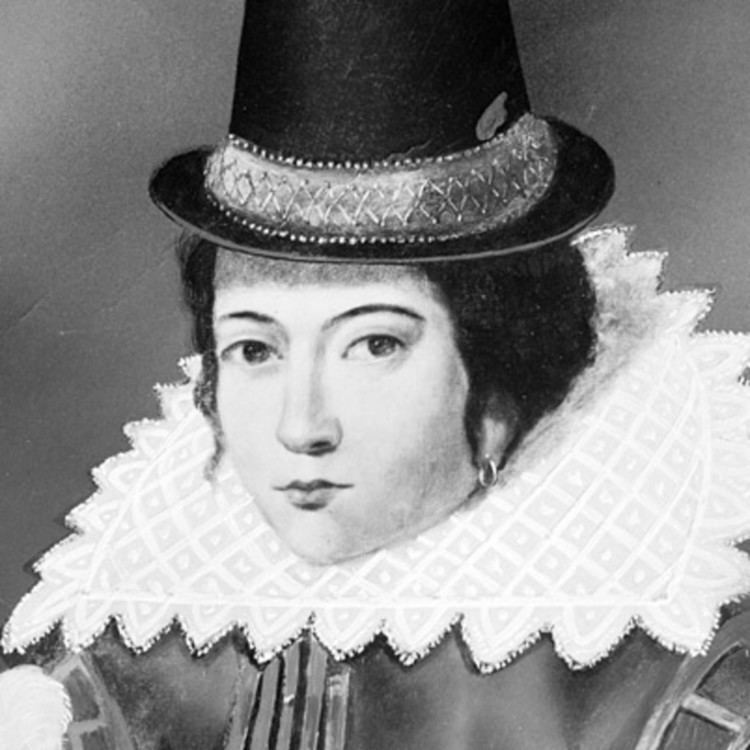 In 1616, Smith wrote a letter to Queen Anne in anticipation of Pocahontas's visit to England. In this new account, his capture included the threat of his own death: "at the minute of my execution", he wrote, "she [Pocahontas] hazarded the beating out of her own brains to save mine; and not only that, but so prevailed with her father, that I was safely conducted to Jamestown." In his 1624 Generall Historie, published long after the death of Pocahontas, Smith expanded the story. Writing about himself in the third person, he explained that after he was captured and taken to the paramount chief, "two great stones were brought before Powhatan: then as many as could layd hands on him [Smith], dragged him to them, and thereon laid his head, and being ready with their clubs, to beate out his braines, Pocahontas the Kings dearest daughter, when no intreaty could prevaile, got his head in her armes, and laid her owne upon his to save him from death ..."
In a later publication, True Travels (1630), Smith claimed a similar rescue by another young girl in 1602, following his capture by Turks in Hungary; the story resembles a popular contemporary type of moral tale, in which a Christian hero maintains his faith despite threats and intimidation. Karen Ordahl Kupperman suggests that Smith used such details to embroider his first account, thus producing a more dramatic, second account of his encounter with Pocahontas as a heroine worthy of reception by Queen Anne. Its later revision and publication was probably an attempt to raise his own stock and reputation; he had long since fallen from favor with the Company that had funded the Jamestown enterprise. Gleach, drawing on substantial ethnohistory, suggests that Smith's second account, while substantially accurate, represents his misunderstanding of a three-stage ritual intended to adopt Smith, as representative of the English colony, into the confederacy; but not all writers are convinced, some suggesting the absence of certain corrborating evidence. Early histories did establish that Pocahontas befriended Smith and the Jamestown colony. Pocahontas often went to the settlement and played games with the boys there. When the colonists were starving, "every once in four or five days, Pocahontas with her attendants brought him [Smith] so much provision that saved many of their lives that else for all this had starved with hunger". As the colonists expanded their settlement further, the Powhatan felt their lands were threatened, and conflicts arose again. However, Kocoum's actual identity, location, and even existence have been widely debated among scholars for centuries, with several historians arguing that the only mention of a "Kocoum" in any English document is taken from a brief statement written c. 1616 by William Strachey in England that Pocahontas had been living married to a "private captaine called Kocoum" for two years. 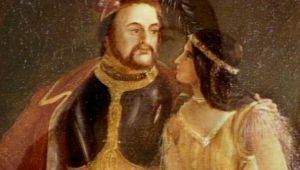 Since 1614 is certainly when she married John Rolfe, and no other records even hint at any previous husband, it has accordingly been suggested that when Strachey wrote of the "private captaine called Kocoum" he was mistakenly referring to Rolfe himself, with the reference being later misunderstood as one of Powhatan's officers. There was a Powhatan military rank called kokoraws, sometimes translated "captain", and scholarly debate has also raged whether Strachey could have meant this as one of his famously divergent spellings, as a gloss to "Captayne". In addition, the date of Strachey's original statement has been widely disputed by numerous authors attempting either to make the case, or refute, that Pocahontas had been previously married. If there was such a marriage and Kocoum was not murdered, it likely ended, according to Powhatan custom, when Pocahontas was captured. Pocahontas's feelings about Rolfe are unknown. They were married on April 5, 1614 by chaplain Richard Buck, probably at Jamestown. For two years they lived at Rolfe's plantation, Varina Farms, across the James River from Henricus. Their son Thomas was born on January 30, 1615. Pocahontas was apparently treated well in London. At the masque, her seats were described as "well placed", and, according to Purchas, John King, Bishop of London, "entertained her with festival state and pomp beyond what I have seen in his greate hospitalitie afforded to other ladies". Not all the English were so impressed. 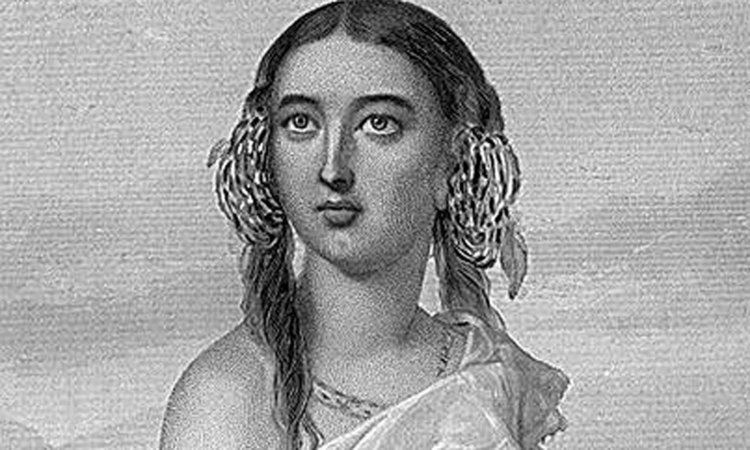 According to Helen C. Rountree, "there is no contemporary evidence to suggest ... that Pocahontas was regarded [in England] as anything like royalty". Rather, she was considered to be something of a curiosity and, according to one observer, she was merely "the Virginian woman". Were you not afraid to come into my father's country and caused fear in him and all his people (but me) and fear you here I should call you "father"? I tell you then I will, and you shall call me child, and so I will be for ever and ever your countryman. Pocahontas' funeral took place on March 21, 1617, in the parish of Saint George's, Gravesend. Her grave is thought to be underneath the church's chancel, though since that church was destroyed in a fire in 1727, her exact gravesite is unknown. Her memory is honored with a life-size bronze statue at St. George's Church by William Ordway Partridge. Pocahontas and her father, Chief Powhatan, have many notable descendants, including Edith Bolling Galt Wilson (Woodrow Wilson's wife), American Western actor Glenn Strange, astronomer and mathematician Percival Lowell and members of the First Families of Virginia including George Wythe Randolph, Admiral Richard E. Byrd, and Virginia Governor Harry F. Byrd. Miss Pocahontas (Broadway musical) - Lyric Theatre, New York City - Oct 28, 1907. Pocahontas (1995), a Walt Disney Company animated feature which presents a fictional love affair between Pocahontas and John Smith, in which Pocahontas teaches Smith respect for nature. Davis, John (1803). Travels in the United States of America.